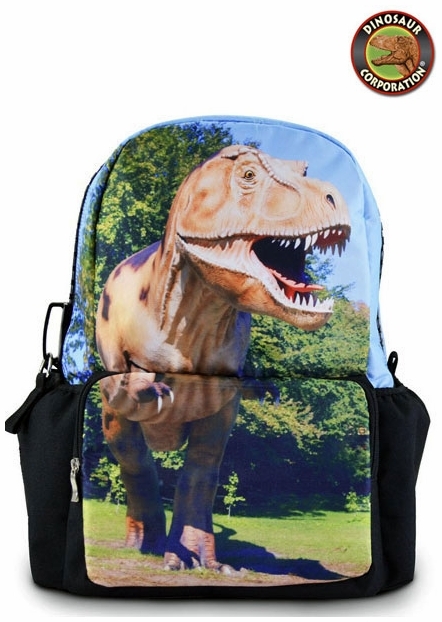 T-rex dinosaur school Backpack for dinosaur enthusiasts loving everything prehistoric. A convenient backpack for your child to have, with two large compartments for carrying books and school supplies. A carrying handle on the top of the bag, water compartments on either side of the bag, with comfortable padded shoulder straps that are adjustable for all kids. Large size: 17" high x 12" wide x 7 deep (43cm x 30.5cm x 18cm).